MIT president L. Rafael Reif (left) chatted with Tim Cook during the procession Friday. 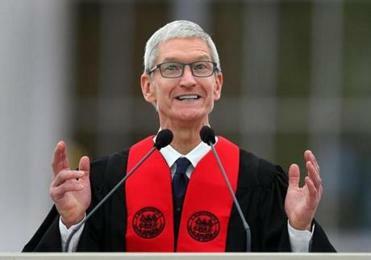 CAMBRIDGE — Apple chief executive Tim Cook urged MIT graduates Friday to infuse their work with humanity, cautioning that technology alone is not enough. “If you choose to live your lives at that intersection between technology and the people it serves, if you strive to create the best, give the best, do the best for everyone, not just for some, then today all of humanity has good cause for hope,” Cook told the 2,900 graduates, their families, and guests gathered on Killian Court on the sunny morning. Cook drew chuckles from the audience — who greeted him by waving their iPhones in the air — as he recounted his path to the top of the transformative tech company. But after Cook’s search landed him at Apple, he said, he found purpose in a company with a simple mission: serve humanity. Apple’s chief executive was spotted at the store after he addressed MIT’s commencement. “And it was in that moment, after 15 years of searching, something clicked. I finally felt aligned,” he said. Cook encouraged the graduates to work for something greater than themselves, and in doing so, find meaning. Cook acknowledged that technology designed to connect us can actually divide us. He highlighted threats to security and to privacy, and the antisocial aspects of social media as some of technology’s inherent pitfalls. “I’m more concerned about people thinking like computers — without values or compassion, without concern for consequences,” he said. But technology can often be the solution, he said, and as new alumni of MIT, the graduates were already on track to see that realized. “If we are ever going to solve some of the hardest problems still facing the world today — everything from cancer to climate change to educational inequality — then technology will help us do it,” Cook said. He marveled at the “big ideas” that have already come out of MIT, including trademark student hacks. “I’ll never figure out how MIT students sent that Mars rover to the Kresge Oval, or put a propeller beanie on the Great Dome, or how you’ve obviously taken over the president’s Twitter account,” Cook joked. Cook, who took over at Apple in 2011, oversaw the rollout of the iPhone 7 and the Apple Watch. He previously served as chief operating officer and headed the Macintosh division. In his address Friday, he highlighted his company’s products and core values as examples of technology that puts people first. The Apple Watch that can detect a heart condition before it becomes a heart attack, for example, or the iPad that can connect children with autism to the world around them. “When you keep people at the center of what you do, it can have an enormous impact,” he said. Cook spoke at the Massachusetts Institute of Technology just two weeks after Facebook founder and chief executive Mark Zuckerberg delivered the commencement speech at Harvard University. Zuckerberg spoke to Harvard’s graduates as peers within the same generation, setting their sights on achievement. Cook spoke to the MIT graduates as a generation coming up to meet lofty expectations. The responsibility is immense, he said, but so is the opportunity. 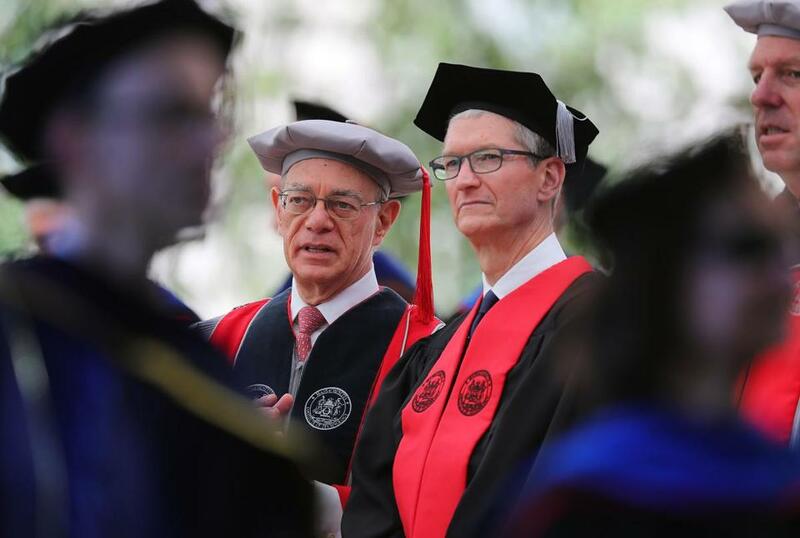 Apple chief executive Tim Cook urged MIT graduates Friday to infuse their work with humanity, cautioning that technology alone is not enough. Cook’s search landed him at Apple, he said, he found purpose in a company with a simple mission: serve humanity.